On the market is a 3,122 sq ft, six-bedroom strata terrace at The Teneriffe, with an asking price of $2.77 million ($887 psf). The Teneriffe is a 148- unit, strata townhouse development on Laurel Wood Road, just off Sixth Avenue in prime District 10. The 99-year leasehold project was developed by Jack Investment and completed in 2003. The house that is on the market is a corner unit with a north-south orientation, and surrounded by greenery, according to Daniel Lee, associate group director at PropNex Realty, who is marketing the unit. The five bedrooms are on the upper levels, while the sixth bedroom is in the basement. The house comes with two private parking spaces and extra storage space in the basement level. Five years ago, the owners of the house spent $150,000 to renovate the kitchen, patio and basement, as well as repaint the entire house in neutral white. The house can also be rented out fully furnished at an average monthly rent of $8,500, according to Lee. 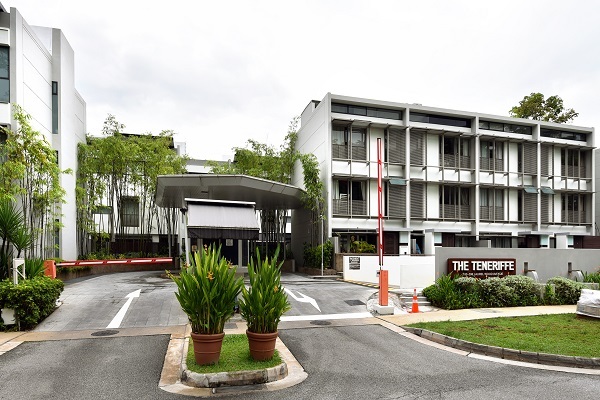 The location is ideal for families, as it is near prestigious educational institutions in the Bukit Timah area such as Methodist Girls’ School, Raffles Girls’ Primary School and Nanyang Girls’ High School, as well as National Junior College. The development is located about 800m from the Sixth Avenue MRT station on the Downtown Line and near amenities such as eateries at Sixth Avenue, Turf City and Holland Village. The latest successful resale at The Teneriffe was for a four-bedroom, 2,831 sq ft strata terraced unit. It changed hands for $2.47 million ($873 psf), according to a caveat lodged at the end of February. The unit was last sold for $2.38 million ($847 psf) in July 2007. Towards the end of January, a similar-sized unit (3,122 sq ft) to the one currently on the market fetched $2.7 million ($865 psf). At the start of January, another unit with five bedrooms and 3,175 sq ft in strata area went for $2.65 million ($835 psf), according to caveats lodged then.